This is Captain James T. Sutherland. He was a shoe salesman by trade and a veteran of the First World War. But he would best define himself in the world of hockey - as a notable referee, a long time member of the Ontario Hockey Association's executive committee, and perhaps most famously as the creator of the Hockey Hall of Fame. In 1938 Major League Baseball created the Baseball Hall of Fame in Cooperstown, New York. Sutherland almost immediately began his campaign to see hockey get it's own Hall of Fame. By 1943 Sutherland's unrelenting drive succeeded. The National Hockey League and the Canadian Amateur Hockey Association created the International Hockey Hall of Fame. However the Hall had no physical location. 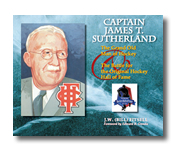 Sutherland devoted his life to getting a proper Hall of Fame built in Kingston, Ontario. Kingston was his hometown, and, he believed, the birthplace of hockey. The National Hockey League would withdraw it's support of the IHHOF in 1958 and would begin creating it's own Hockey Hall of Fame, the one we all think of to this day, in Toronto. Despite this major setback Sutherland continued with his dream, and by 1965 the IHHOF moved into its home on 277 York Street in Kingston. You can still go and visit two floors worth of exhibits. Many other exhibits are in storage as they seek a new home. You can read all about the history of the IHHOF/HHOF in the new book Captain James Sutherland and the Battle for the Original Hockey Hall of Fame by Bill Fitsell. You can also visit the Original Hockey Hall of Fame's website.